I was driving home from work after an extended shift at Universal. It was near ten o’clock when I finally answered that number on my cell I didn’t recognize after the twelfth attempt. I remember exactly when and where I was when I got the call. It was so strange to hear a stranger flat out tell me my mother had died. I didn’t understand. I had spoken to her five days prior. She was fine! Apart from a recent stroke and issues with her blood pressure, she was okay. I thought it was a joke. I remember pulling into a gas station, scrambling to find a pen inside my old beat up ’98 Ford Ranger. When I finally did, it exploded in my hand as soon as I removed the cap. I guess the 101F degree weather in Orlando, Florida melted the ink capsule. I’m crying hysterically as I try to explain to the person on the other line that I needed a minute to find another pen. They were in a hurry for me to collect my mother’s body, as the morgue was full at the hospital, it was summer, and they needed her out of there immediately. A man at the station saw me, grabbed the phone, and spoke to them. He wrote the number down for me, and hung up. I remember him clearly. He was in his fifties, just as old as my mother, and he was at the gas station with his son. He wrapped me in his arms, cried with me, and bought baby wipes at the station to clean the ink from my hands and face. He rocked me, and continuously said, “I’m sorry, kid. I’m sorry.” The man’s son held my hand, and to this day, I haven’t forgotten how hard he was squeezing it, bringing it up to his cheek, and rubbing his stubble against it. It was comforting. I never learned their names. They never knew mine, but they took the time to console me during one of the most terrible moments of my life. 2006 was the worst year of my life. Every year I remember my mother on this particular day. I miss her deeply. I wish I could see her again, but I also know she is where she needs to be, and she’s no longer in pain. She’s up there with my brother now (he joined her exactly three months after she passed). So, Mom, I hope you’re happy, proud of me, and everything in between. Your departure made me a stronger person, I just didn’t realize it at the time. I miss you, and I pray you are watching over us every second of the day. Especially Izzy, who has your beautiful smile, hands, and silky hair, but more importantly, she has your spirit. 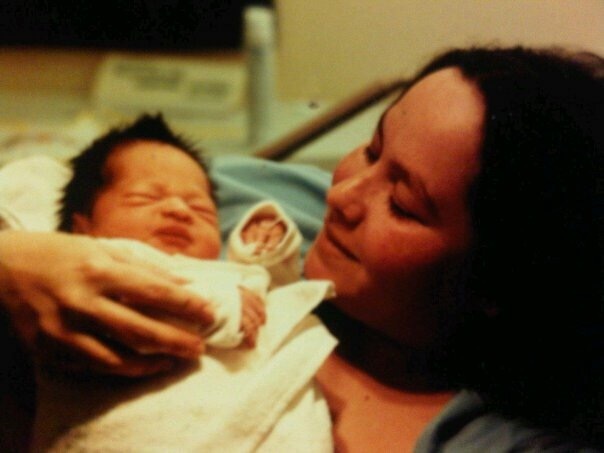 This is my Mom and me on the day I was born. What a wonderful story to stumble upon. We all have had moments similar to this as our mothers or loved ones passed away. Its nice to have someone there to help us through our grief. Thank you for sharing this. Made me cry. But it was especially touching to read about the man at the gas station. Proof that there are still some very kind, caring people out there.